Liverpool boss Jurgen Klopp endured a frustrating first game at Anfield as the Reds were held to a draw by 10-man Rubin Kazan in the Europa League. The visitors took the lead through Marko Devic's stunning half-volley but had captain Oleg Kuzmin sent off for a second yellow card soon after. 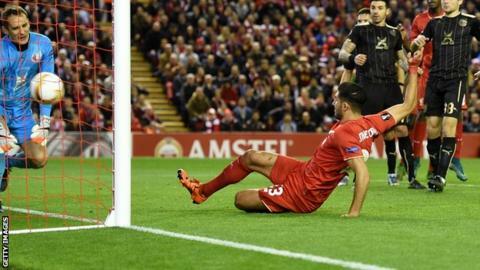 Liverpool responded as Emre Can stabbed in following a free-kick. Substitute Christian Beneteke hit the post late on as Liverpool were held to a third successive Group B draw. Despite pressing late on, it was ultimately a difficult evening for Klopp and Liverpool as they struggled to break down their Russian opponents for large periods of the match. The result leaves Liverpool second in their group on three points, four behind leaders FC Sion. The arrival of Klopp has been greeted with excitement by Liverpool fans since he was confirmed as successor to Brendan Rodgers. The 48-year-old's first appearance in a Liverpool dugout was at Tottenham last weekend but Thursday marked his first competitive appearance at Anfield. In his programme notes, Klopp praised the "special atmosphere" the fans created, and they certainly extended a warm welcome for the German. Stall traders sold scarves outside the ground boasting "the Klopp revolution", while fans waited eagerly for autographs and a photo with their new manager. It was not only the fans who were keen to witness Klopp's first game in charge, with the club's owners having flown in for the game. Klopp's appearance from the tunnel just before kick-off was met with rapturous applause, but any excitement about a new era gave way to frustration as Liverpool's familiar failings this season were once again on show. Under Klopp, Dortmund reached the Champions League final in 2012-13 and climbed from 110th to 13th in the Uefa rankings. Liverpool fans will hope he can have a similar impact at the Reds. They are currently ranked 54th in Europe, sandwiched between FC Genk and APOEL. Europa League success is perhaps not the supporters' priority, but they will welcome improved displays in the competition after disappointing draws against Bordeaux and FC Sion this season. Liverpool's early endeavour against Rubin Kazan was encouraging as they played quick, one-touch football and attacked at pace. However, when Rubin took the lead, albeit against the run of play, Liverpool - along with the home fans' enthusiasm - faded. Kuzmin's sending-off - he was shown a second yellow card for stopping Can - and Can's subsequent equaliser lifted Anfield again. Liverpool, though, failed to build on that. Despite a late flurry as Rubin Kazan's players retreated further into their own half to protect the point, the hosts lacked the creativity to score a winner. Klopp felt Liverpool had their moments, but accepted the sending off made it more difficult for his side. "It was a very interesting game, a big challenge because of the quality of Rubin," he said. "Sometimes it is a big advantage against 10 men, most of the time they stop playing football and defend in a compact block. "It was not a masterclass but it was not the worst day in my life." Klopp was appreciative of the reception the Liverpool fans gave him, adding: "It was one of the best moments for me. "I felt everything positive and then I concentrated on the game." It is another home game for Klopp as Liverpool entertain Southampton on Sunday. Their next Europa League game is at Rubin Kazan on 5 November. Liverpool are winless in their last eight group stage matches in Europa League or Champions League (D5 L3), drawing each of the last five. The Reds had 35 shots in this match (including blocks), Rubin Kazan had five. Liverpool have kept just one clean sheet in seven games at Anfield this season (v Bournemouth in August). Match ends, Liverpool 1, Rubin Kazan 1. Second Half ends, Liverpool 1, Rubin Kazan 1. Attempt missed. Lucas Leiva (Liverpool) left footed shot from outside the box is close, but misses to the left. Foul by Igor Portnyagin (Rubin Kazan). Attempt missed. Martin Skrtel (Liverpool) header from the centre of the box is close, but misses to the left. Assisted by James Milner with a cross following a corner. Corner, Liverpool. Conceded by Ruslan Kambolov. Attempt blocked. Roberto Firmino (Liverpool) right footed shot from outside the box is blocked. Assisted by Nathaniel Clyne. Corner, Rubin Kazan. Conceded by Emre Can. Elmir Nabiullin (Rubin Kazan) wins a free kick in the attacking half. Attempt saved. Christian Benteke (Liverpool) header from the centre of the box is saved in the centre of the goal. Assisted by Alberto Moreno with a cross. Alberto Moreno (Liverpool) wins a free kick on the left wing. Foul by Guillermo Cotugno (Rubin Kazan). Attempt missed. Igor Portnyagin (Rubin Kazan) header from the centre of the box misses to the left. Assisted by Magomed Ozdoev with a cross following a corner. Corner, Rubin Kazan. Conceded by Mamadou Sakho. Maksim Kanunnikov (Rubin Kazan) wins a free kick in the defensive half. Attempt missed. Roberto Firmino (Liverpool) right footed shot from outside the box misses to the left following a corner. Corner, Liverpool. Conceded by Saba Kverkvelia. Attempt missed. Christian Benteke (Liverpool) right footed shot from the right side of the box is too high following a corner. Corner, Liverpool. Conceded by Maksim Kanunnikov. Attempt blocked. Emre Can (Liverpool) right footed shot from outside the box is blocked. Assisted by Alberto Moreno. Corner, Liverpool. Conceded by Magomed Ozdoev. Attempt saved. Adam Lallana (Liverpool) left footed shot from outside the box is saved in the bottom left corner. Assisted by Lucas Leiva. Substitution, Rubin Kazan. Vladimir Dyadyun replaces Gökdeniz Karadeniz. Christian Benteke (Liverpool) hits the right post with a right footed shot from the left side of the box. Assisted by Adam Lallana. Attempt saved. Emre Can (Liverpool) left footed shot from outside the box is saved in the centre of the goal. Attempt missed. Christian Benteke (Liverpool) right footed shot from the centre of the box is too high. Assisted by Nathaniel Clyne with a cross. Mamadou Sakho (Liverpool) wins a free kick in the defensive half. Foul by Maksim Kanunnikov (Rubin Kazan). Foul by Mamadou Sakho (Liverpool). Igor Portnyagin (Rubin Kazan) wins a free kick in the attacking half. Foul by Martin Skrtel (Liverpool). Saba Kverkvelia (Rubin Kazan) wins a free kick in the defensive half. Corner, Liverpool. Conceded by Igor Portnyagin.